Can you really future-proof your HMO? You will have heard me talk about ‘Future Proofing’ your investment as the fifth part of the process of creating a high income-producing HMO. Can you really do this though? What about all the CHANGES that Government makes continually to legislation, policy, rules? How can you protect yourself against these changes and ensure that you are investing for NOW and in the FUTURE? It’s easy to look back and think how fortunate investors were years ago. No limits to the amount of interest they could claim on their mortgage; few limits on mortgage borrowing (even the riskiest of investors could borrow up to 95% LTV back then); limited HMO legislation and much more relaxed rules about housing standards. Ah, the rose-tinted specs of property investing. True? Yes! But was that the shiny penny we all think it was? NO! In those days it was far easier to get into insurmountable debt and repossession was rife! You could own masses of property but not be making any real income as interest rates were far higher. Spareroom, RightMove etc were all in their infancy so you would spend FAR more on advertising (I remember lots of weekly ads in the local paper for example), and HMO rooms were badly thought of back then so it was not a great strategy (unless you were in the student market). So we can all look and think that THEN was better than NOW. The truth is it was DIFFERENT! Not better, not worse! 1) Always do a quality refurb to start with. If you scrimp and save on this part, you will regret it later! Ensure you do a detailed specification of works, have a clear project plan for your builder and stick to time and budget. 2) Make sure the acoustic and fire requirements are met on your HMO before you finish it and snag it. Councils are bringing in more and more safety regulation so you need to be at the front of the curve here. 3) Keep up with the trends in technology and interior design. We fitted CAT6 cabling to many of our HMOs – not a great extra cost, but it is a massive benefit to tenants trying to log on to the wifi. Buy ‘Homes and Gardens’ once in a while and see what other people are doing in design trends. Borrow their ideas and use them to upgrade and cheaply furnish your rooms. 4) Schedule an annual Spring Clean to replace old cutlery, glassware, doormats. All the things that get grubby and soiled and make the place look a mess! It doesn’t cost much but it helps to keep the place updated, clean and tidy. 5) Develop a brand – what are you known for? What is your speciality? What is your USP? Even if you are using an agent, what is it about YOUR HMO that people particularly like? Ensure you highlight these things in your advertising. 6) Stay up to date with legislation changes so you can implement them when the time is right – the best way is to be a member of the RLA or NLA. They produce regular updates and you can go to their websites to find out more. Also, you can register with your local council to be an accredited landlord and go to their (boring but useful) meetings. You never know you might meet a tired landlord with whom you can do business there! 7) Understand the needs of your tenants and get to know them – what are the changes they are responding to in the marketplace and how can you meet those changes? Can you add in additional services or offers that will help them to stay and pay? I would LOVE to know what your ideas are! Please share them here in the comments below! 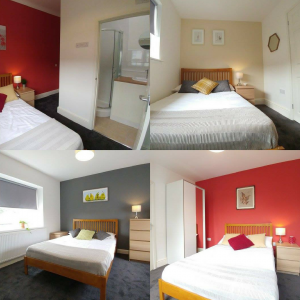 Tenanting without Tears – How to fill your HMO rooms! For many property investors, the excitement of investing in a House of Multiple Occupation (HMO) consists of finding the right property, buying it and then refurbishing it to just the right standard – just enough to attract tenants but not too much so that you blow the budget. Many property courses focus on sourcing and refurbishment of a property, but if you can’t fill your rooms the investment falls apart. Often you might use a lettings agent to rent out your property, saving you the time and hassle of finding the right tenants. Many agents are not familiar with the unique configuration of HMOs and if this is your first HMO you will need to start to look for an agent quite early on to ensure you choose one who is experienced at letting HMO rooms. f) Whether you want to do it! It’s important to have a process which will help you FIND the right tenants, SCREEN the right tenants, KEEP the right tenants and enable you to turn your rooms round quickly at the end of the tenancy for the process to begin all over again! I’ve named the process ‘‘Tenanting without Tears’, a process refined over my many years of managing my own property portfolio. There isn’t many situations I’ve not experienced over the years! If you prepare thoroughly for letting a room this will save you lots of time and effort later trying to recapture the same information and will form the basis of future room rentals which will allow you to leverage your time from the get-go. to action to encourage them to respond. for their move, their budget and their occupation. Once you have a time and date agreed, note this in your diary and include the telephone number of the person. 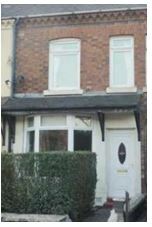 When you carry out viewings you are ascertaining whether the tenant is right for you as well as if they want to rent a room from you. such as name, current address, telephone number and email; their job and salary details; the details of referees and in what capacity are they known by the referee; and information about identification being provided. After all paperwork has been completed, spend some time explaining to the tenant what is required from them and what the rules and regulations are. Explain what they should do in the event of an emergency and your office opening hours. Courtesy Call – A week after your new tenant has moved in call them, email them or text them to ask how everything has gone and check that they are settling in well. Any problems can be ironed out faster and any teething problems dealt with. You can reiterate your commitment to the standards they can expect (and outline your office hours too)! When a tenant gives you their notice to leave, there are some simple steps to follow to ensure the move-out happens swiftly and smoothly and to ensure you have no hiccups and don’t face major maintenance issues. To see the full version of ‘Tenanting without Tears’ and more of my easy to use suggestions for creating a high cash-flowing HMO business in my best selling book ‘101 Essential Tips for Running a Professional HMO – Giving you time, money and freedom’. Currently available for Free (Just pay P&P). Visit http://www.101essentialtips.co.uk/ to claim your copy! Buy to let is dead. Right? Well, maybe Buy to Let in its traditional form is dead! Certainly buying in your own name, putting down a reasonable deposit and then a few months or years later refinancing all of your money out is something fewer and fewer investors want to do now. We have George Osborne to thank for that. Investing in Buy to Let has seen a huge amount of change in the last few years, with new legislation that impacts financing, as well as property tax changes which, has left many landlords questioning if Buy to Let is still a viable investment strategy. With that said there is still a huge demand for rental property and with ever increasing ‘transient’ lifestyles people want flexibility, gone are the days when people what to live in the same house for 40 years! If you have been wondering what is the alternative, and how you can make your money work for you, I’d like to suggest House of Multiple Occupation are one way you can address this problem. We hold a number of personal B-T-L properties but a few years ago realised that there were other strategies we could use. When I discovered HMOs I raved on and on about them (in only the way a demanding wife knows how to do) and eventually Andy said ‘OK, let’s give it a go’. 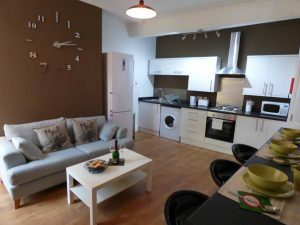 That was our very first 4-bed Mini-Mo and since then we have not looked back! If you don’t have much money to invest, or you are concerned about whether this strategy will work for you, then I’d like to invite you to my NEW and IMPROVED HMO Fast-Track Live Event on 14th October in Birmingham. I’ll be sharing with you how to get started with very little of your own money and LOADS of case studies about how you can make huge profits and BEAT THE TAXMAN! SELL rooms effectively so you avoid voids! LEVERAGE your time so you can rinse and repeat! With a mixture of fun, interactive exercises & relevant examples of REAL HMOs, I will share my tried and tested systems to ensure you grow your flow with HMOs. So are you ready to go on your own HMO adventure? YES PLEASE RESERVE ME PLACE! When I was at secondary school it has to be said that if they’d done ‘A’ levels in Boys, Parties and Nightclubs, I would have got three A*s. Unfortunately they didn’t, so I didn’t get those results either. In fact, I really spectacularly failed to achieve what I was capable of in the subjects I chose. I think many people who become investors have had similar experiences to me, and find themselves having a hard time breaking through the belief that they are not clever enough, not good enough or not talented enough to do property. I wrestled with that too. Until I realised that education in the property world is very different. For a start it requires you to take RISKS. There is no certainty that you will get the outcome you want. In fact you need to have the mindset of growth and learning at all times to manage this fear of failure. Secondly, it takes COURAGE – you have to put your money, your time, even your reputation on the line. People may scoff, ridicule or undermine you and you have to find the courage to believe in yourself. Thirdly you have to take practical ACTION. The theory is all very well but until you put your learning on the line, you will never become a real investor. Having the right mindset and the right skill set is VITAL so that you do not get upset (as one of my mentors once taught me)! Which is why next Sunday I will be spending time on YOUR mindset AND your skillset! That’s if you will let me …. You see next Sunday I’m launching a BRAND New event – HMO Fast Track LIVE. Not only will you learn exactly how to invest in HMOs – how to find them, plan them out and make them work efficiently, you will also learn how to have the right MINDSET to attract investors, to grow your business and to become financially free. I look forward to seeing you there – if you have any questions please do not hesitate to get in touch! 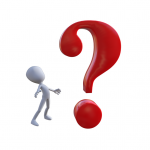 The 5 Most Powerful Questions you Should Ask an Estate Agent… and Why They Matter! When I first started investing in property (in 1996 – yes I was only 3 years old – lol!) my aim was to create a pension. 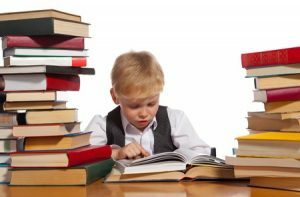 I was a stay-at-home mum with two boys and knew that I needed to start thinking about the long-term, even though retirement was a long way off. I had no idea whether I would buy other properties or not, but after the success of the first one, I really wanted at least one more so each of my sons would inherit one property. After I had about six single buy-to-let properties I began to ask whether I really did want or need anymore. After all, I had more than enough for the boys (and by then my children had doubled in number), and I stood back and realised I had achieved my goal – to provide something for my retirement and also a legacy for my children. The real question I was asking myself was ‘WHY carry on investing’? ‘What is the REAL reason to invest’? Was it for a future legacy as I had first imagined? Or had my WHY changed? I came to acknowledge that I wanted more from property. I saw others who had made a living from it – a lifestyle not just a legacy. And the benefits of that kind of life seemed obvious to me: more time with the family, more flexibility to spend my time as I wanted to, and fulfillment knowing I was giving back to society. So in effect I started again in 2012. But this time with HMOs. And this time, for cashflow not just capital growth. And in two and a half short years, we as a family were financially free! I’m sure you know your WHY too. Just as I did, if you want to change your life, create cashflow and be financially free you need to do what others won’t to have what others can’t. Therefore, I would like to give you the opportunity to make that happen. It won’t always be easy, it won’t always be plain sailing and I’m sure you will hit obstacles along the way. To save you time and money it’s so important that you learn the fast way, the short-cuts, the tricks of the trade. You need to learn from someone who’s done it and can show you each step of the way how to make it happen. You need to see how possible it is for YOU no matter what your situation. I’d like to invite you a very special one-day event called ‘HMO FAST TRACK LIVE’. It’s my brand new event focused on learning all about HMOs, but where you’ll also have a mindset shift to realise this is not just a dream – this is possible – and it’s possible for YOU! I’m thrilled to be working with Adam Cooper – an investor, Joint Venture partner, and HMO expert based in Peterborough, and together we’ll be hosting the event. You’ll be able to ask us lots of questions, learn all about the deals we’ve done, and best of all find out how just FOUR HMOs can make you financially free. Find out more below and reserve your space now! Knowing how to get your goods to market is vital if your business is going to succeed, and this is no exception when it comes to renting rooms. When Spareroom (the UK’s largest flat-sharing website) was launched, it changed the landscape for HMO property investors overnight. There is an argument that it enabled the sector (particularly professional HMOs) to grow exponentially as it allowed landlords and investors to have an immediate and interactive presence on the internet. Even if they had no website, marketing strategy or smartphone, the power of Spareroom was that it removed the pain of advertising for landlords, placing any room directly in front of a willing and ready buying audience. Since its inception in 2004 Spareroom has continued to be top of the room-renting listings portals and has developed additional features and benefits for both tenants and landlords. There are a number of aspects of which you may not be aware, and in this post, I want to share some of those functions which may help you reduce room voids and increase your profits – particularly if you are not familiar with some of the newer and more dynamic features of the site. Spareroom is an online environment which changes daily. It is a site where prospective tenants and aspiring landlords create profiles and upload photos and videos with ease. They get over 2 million visitors every month – that’s 11 times the circulation of the Guardian. Much like online dating, there are constant matches, suggestions and recommendations being made to tenants and landlords. Unless you are aware of the speed at which the site can change, you will probably miss out on potential tenants who could be ideally suited to your property. 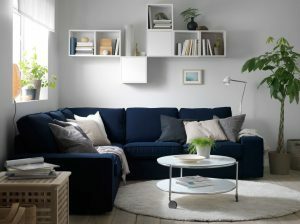 Unlike many marketplaces where you cannot see your customer, Spareroom helps connect you directly to people who may be interested in renting a room. In a busy marketplace where choice abounds and there are a number of good looking rooms to choose from, what sets you apart from the rest? Research tells us that tenants prefer to rent from private landlords or people that they feel they can connect with, and who they feel care about them. They don’t like to be treated just like a number (well who does)? They also stay longer in properties where the landlord takes maintenance, customer care and service seriously and puts tenants’ needs first. So rather than waiting for prospective tenants to contact you, you can carry out a search for your ideal tenants on ‘Rooms wanted’ by typing in your chosen location (i.e. the location of your HMO). This will bring up a list of people who are looking to rent in your area, along with their budget. Send them a friendly message, inviting them to arrange a viewing of your property (along with a link to the advert). This also allows you to decide on people who look like a good fit with your property and ensure they meet your requirements. The personal invitation to view is a great way to demonstrate your proactivity. Make sure you read their preferences first though otherwise it won’t look as if you really care if they’ve stated they want a large double ensuite room and all you have to offer is a single with a shared bathroom! Early Bird status allows all new prospective tenants to see your advert as soon as they log in or create their profile. [Named Early Birds by dint of paying extra to see new adverts first. It doesn’t mean they are early risers – please don’t confuse the two]. If you have not paid for Early Bird status it will be a few days before your advert is placed before new tenants, losing you time and valuable viewing opportunities. Bold Advertising enables your ad to be displayed with a lovely blue border around it this differentiating it from the standard grey border, and enhancing the placement of the listing. For these services you can pay for a monthly, 3-monthly, or annual fee for a defined number of property adverts. If you wish to add further properties to the Bold Advertising pass this is possible too. Usually, Early Bird and Bold Advertising are purchased together. Featured Ad status is a pay-per-click service. This works on the basis of a bid price which is calculated by Spareroom’s internal algorithm. It takes into account the number of rooms available in your locality, the level of competition for top advertising space, and the number of potential matches for your advert. As I mentioned earlier, Spareroom is a dynamic advertising environment which means that there can be rapid transactions taking place simultaneously. You can find that one day the cost to place your room advert at number one position is 80p and then a week later, £1.20. To understand the way Featured Ad status works and how to get to number one position, you need to go to ‘My Featured Ad’ page (which you get to by clicking on ‘Settings and stats’) accounts management page and click the tab named ‘Rankings’. Here you will be able to assess the current ranked status of your advert and decide how much you are willing to pay to be at number one in the rankings. You can then decide how much to pay for the privilege of number one position by going to ‘Individual Ad Bids’ (on the same page). It is worth considering Featured Ad status if you have one particular room that you’re finding hard to shift. Avoid having a number of adverts all featured at once, or you’ll find you are bidding against yourself and then having the difficult choice of which one to prioritise. Otherwise, remember the tips above to keep your advert fresh and current to raise enough interest to rent your room. Spare room recognises that the site has many facets and if you are new to online advertising you may need some additional advice and help. If you click on the ‘Info and advice’ tab in the top right-hand corner of the site you can gain further access to useful information and examples about how to improve your advert, how to create a video, how to describe your room, how to market your property effectively, and much more. Spareroom is a marvellous resource if you know how to use it. But it can be overwhelming and confusing too! 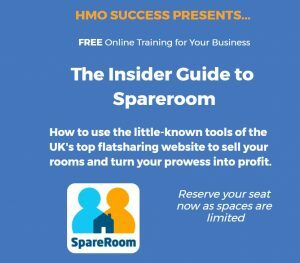 For a free webinar with further information about ‘How to Harness the Power of Spareroom’ please visit my website www.hmosuccess.co.uk and register with your name and email address. Free webinar insider guide to Spareroom, register now!